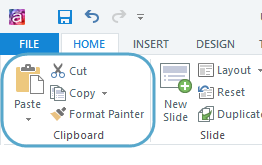 The Articulate Storyline clipboard lets you cut, copy, paste, and duplicate content. There's also a handy feature, called the Format Painter, that quickly copies attributes from one object to another. In this tutorial, we’ll get acquainted with the clipboard tools. Use the keyboard shortcut Ctrl+X. Right-click the selected objects and choose Cut. Go to the Home tab on the ribbon and click Cut. Use the keyboard shortcut Ctrl+C. Right-click the selected objects and choose Copy. Go to the Home tab on the ribbon and click Copy. Use the keyboard shortcut Ctrl+V. Right-click where you want the items to appear and click Paste. Go to the Home tab on the ribbon and click Paste. For more control over how the objects are pasted, click the drop-down arrow below the Paste button and choose one of these options: Use Destination Theme, Keep Source Formatting, or Keep Text Only. Use the keyboard shortcut Ctrl+D. Go to the Home tab on the ribbon, click the drop-down arrow beside Copy, and choose Duplicate. Select the object whose formatting you want to copy. Go to the Home tab and click Format Painter. Your cursor will change into an arrow with a paintbrush to let you know that the Format Painter is active. Click the item where you want to apply the same formatting. The formatting gets copied, and the Format Painter automatically turns off. Tip: When you double-click the Format Painter button, it'll remain active until you turn it off. This lets you apply the same formatting to multiple objects. To turn the Format Painter off, just click it again or press the Esc key on your keyboard.